CLick to Join or Renew with the NMMHA! Welcome to the New Mexico Manufactured Housing Association! The New Mexico Manufactured Housing Association (NMMHA) is the trade association that represents the retailers, manufacturers, suppliers, and communities of the manufactured housing industry in New Mexico. The purpose of the NMMHA is to serve its membership while simultaneously promoting the general welfare and interest of the manufactured housing industry throughout the state. The NMMHA is composed of professionals committed to successfully representing the interest of our members and the New Mexico manufactured housing industry, particularly on a state level by providing dedicated representation in the New Mexico legislature. As a membership-based association, the NMMHA is also extremely concerned with supplying our members with the information and resources necessary to conduct a successful business by offering various membership benefits. In addition, the NMMHA also has a variety of resources to help consumers find the right New Mexico manufactured home for you. You'll find information on the benefits of manufactured homes, manufactured home communities, home builders, financing, and more. Whether you are a first time home buyer exploring housing options for your upcoming retirement, or meeting the demands of a growing family, you will find that a factory constructed home offers a wide range of creative and affordable options. A manufactured home is designed to utilize every square foot of floor space, meet a stringent building code and maximize energy needs while providing you and your family with all of the durability, function, and comfort you expect for your housing dollar. 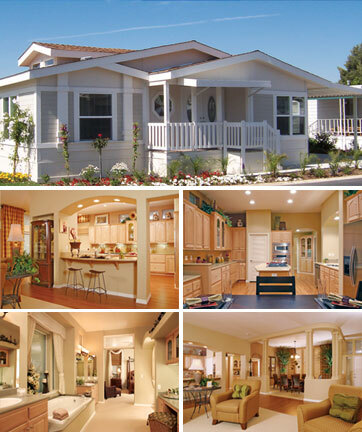 In addition, manufactured homes offer a quality home built indoors, in a controlled factory setting. Building a home indoors allows the manufacturers to control every aspect of construction without the interference of weather, unlike outdoor construction where materials, workers and the entire home-building process are at the mercy of Mother Nature and construction may come to a halt for long periods of time because of weather conditions. Although the materials used in manufactured housing are the same as in site-built housing, the materials used to craft your manufactured home are stored indoors and then assembled in a controlled climate, making the most of both materials and worker talents. The time frame to build your new manufactured home will also be shorter, saving months in the construction process – allowing you to begin your dream-living sooner. Continue through the rest of our website to see the many more reasons to buy manufactured housing! Known for being one of the best places in the world to view the night sky, visitors come from the big cities to admire the beauty and brightness of New Mexico's sky. Many of them make it a permanent home once they've experienced the amazing landscapes and great livable conditions in the Southwestern communities. Virtually every advantage of the good life is part of everyday real life in New Mexico. Warm, sunny days, tailor-made for your favorite recreation, from golf to tennis to fishing, boating, and long, lazy strolls with the gorgeous New Mexico sunset as your backdrop. New Mexico is beautiful, has a strong and flourishing culture and many of the events and issues that take place here are interesting and entertaining. The state also has extraordinary weather. New Mexico offers all of the delights of sunshine (about 300 days per year) and low humidity but without the scorching temperatures of the lower elevations. The Albuquerque - Santa Fe metro area includes six major communities, making it the center of the state's commercial and governmental activities. These are the most popular places. The overall cost of living in Albuquerque is 18% below the national average, with a median home price of $170,800 in the Albuquerque metro areas. Santa Fe, one of the oldest cities in the USA, is a more expensive place to live, with median home prices rising above $400,000, with few homes selling for anything below $250,000. However, New Mexico real estate prices have traditionally been some of the lowest in the nation. Helping to balance the costs of some of the more expensive areas, New Mexico's residential and commercial property taxes are among the lowest in the United States, with tax rates depending on the property type and location.